In 1969, I turned in my BA thesis at Reed College: “‘ … and so made town and country one’: the Streetcar and the Building of Portland, Oregon, 1872-1920.” A few years later (1973? 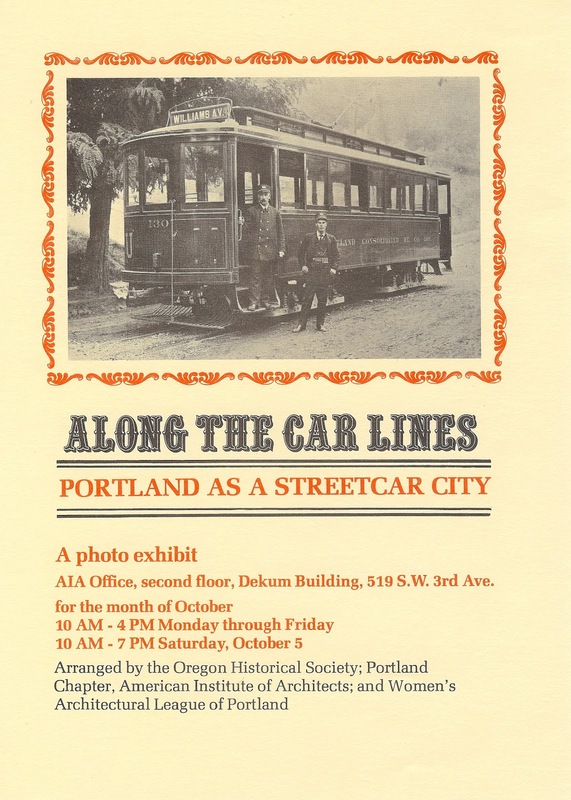 ), Steve Dotterer and I did a streetcar photo exhibit, “Along the Car Lines,” for the local chapter of the American Institute of Architects. In 1986, I did a photo essay on Seattle streetcars in Pacific Northwest Quarterly. And in the summer of 2010 I was interviewed about Portland streetcars by Kami Horton for an Oregon Public Broadcasting episode of The Oregon Experience. That production, “Streetcar City,” first aired February 28, and it is now available both online and as a CD. Steve Dotterrer and I are among the talking heads, as is Richard Thompson, author of several regional pictorial histories of streetcar and railroad lines. There are lots of good film clips and historic photos in the show.